So you’ve just arrived to the mayhem that is the Medina in central Marrakech. You’ve managed to navigate yourself this far among the hordes of people on foot, scooters and bikes darting in and around traffic, taxis and other chaotic drivers honking horns and barely missing each other. Ushered to your accommodation by friendly riad staff or our Splash team, or perhaps you find it yourself, you are mesmerized by the madness and seemingly disorganized movement of people everywhere, noises and smells your nose has never savoured. You’re led to the heart of the medina and then down a narrow alley that turns to the left, you see multiple doors that open into shops, doors to homes, other tunnels, you turn right, the people are getting fewer, the sounds are diminishing. Another turn in the maze of concrete passages; the stone streets uneven and worn, it’s getting even quieter and less people now. Then you stop, a door like all the others stands before you with perhaps a small sign to separate it from the rest. Is this it? The door opens into the unexpected. You’re ushered into absolute peace and tranquillity. You are able to take a long deep calming breath. 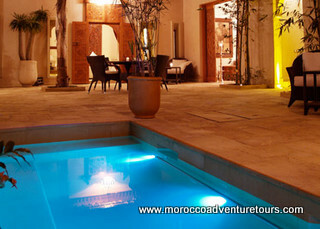 You’ve arrived at your riad and it’s paradise. 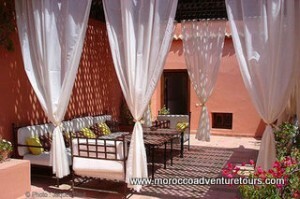 Riad meaning garden in Arabic, it is a traditional Moroccan multi-story house with an interior garden or courtyard. 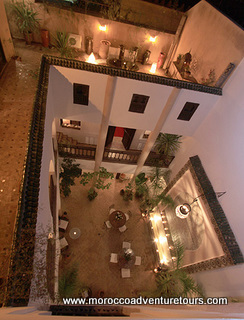 Usually three to four stories high, each room opens onto the central open space of the riad. Most Riads have three to six rooms, although bigger ones can be found, and most are available on a nightly basis. If you are looking to rent for a week or longer, there are possibilities. Lounge and eating areas will often be found on the ground floor with a couple bedrooms and a kitchen. The roof top terrace is a like a little piece of heaven on earth where you can relax high above the madness drowned out below you by the tranquil walls. Some riads offer the traditional hammam, a very therapeutic and cleansing spa, massage or body treatments. Other amenities may be offered as well including wifi, an in-house library, shishas, plunge pools, laundry service, etc. A breakfast of bread, pancakes, fruit, coffee and spreads accompanied by traditional Moroccan mint tea, if you so desire, is served. 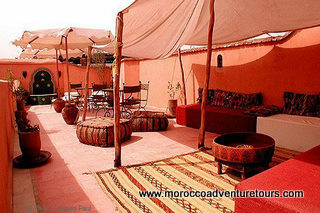 Dinner will be served at some riads upon request, otherwise you can enjoy the nightlife of Marrakech and dine at a food stall located in the square or one of the many delectable restaurants traditional or new. There are about 600 Riads in the Red City of Marrakech and that number can be daunting, so we’ve done a bit of research and found some charming riads for any budget. Check out our Raid Price list to help get you started.